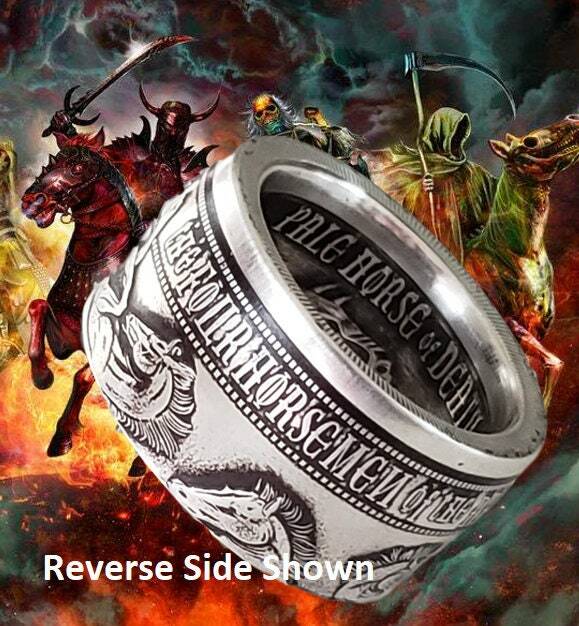 LIMITED EDITION: The Four Horseman Of The Apocalypse Series .999 Solid Silver Coin Ring (1oz Ounce Silver) - Reverse Side Out! While any and all of the Four Horseman look incredible when revealing those as the outside of the band, I've had a lot of requests to make the coin ring showing the reverse side instead so all four horses of the four horseman side with the verbiage "The Four Horseman of the Apocalypse" be displayed outward. Finish: Photos show the ring in "Antique Patina Finish" although several alternative finishes are available to choose from. Availability: The coin is no longer being minted and very limited to come by. The price has more than doubled on this coin from last year in price and will only continue to rise! To make a reverse side out most don't care which coin I use but if you do, just let me know otherwise I'll use any one of the four below to make this for you. FIND WHAT YOU ARE LOOKING FOR FAST! Were you aware the majority of all net proceeds are donated to the Wounded Warrior Project charity to help our disabled vets get the treatment needed beyond what is provided by the government or military VA. The WWP assists in extended medical, rehab, re-vocational and assisted living. As a fellow vet who never needed these things, I thank you for taking care of those real heroes who do! THIS ARTIST IS AMAZING! His pieces are outstanding, and inspired! I've bought coin rings every month from him. They are all treasures! I especially love his faith based ones; he has a great selection. He sends them out timely, and customer service is excellent. Also, when you purchase his rings, the proceeds help the Wounded Warrior Project. He's a consummate patriot. Highly recommend!